Dr KG Umesh: Weakness in hind legs of aged pet may result from dysfunction of the nervous system, neuromuscular system, metabolic, cardiovascular or joint problems. Therefore, the cause of such weakness can either be such primary disorder or can result from dysfunction of a number of other systems that result in impaired neuromuscular function. Some common causes include spinal/backbone problems (particularly disk), heart problems, anemia and arthritis. A reasonable work-up for the weakness is required with selected tests to identify underlying cause, considering pet’s age, breed and concurrent clinical signs. This will help your vet to provide appropriate treatment plan based on cause. Physiotherapy and supportive treatment may benefit until cause is identified or when no underlying problem can be identified. The average life span of Labradors in India may range from 10-16 years depending on level of care. 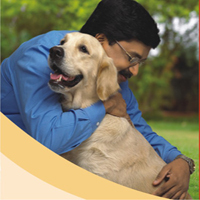 Dr KG Umesh: Feeding your dog a well balanced diet is clearly necessary to keep him fit and healthy, and there is a whole variety of different types of products to choose from, including diets designed for specific stages of life (Pedigree puppy) and foods which deliver additional health benefits (Pedigree small breed puppy). Just curd or fruits is not adequate for a growing puppy. Please remember that it is not possible to feed your dog a consistent and adequate home-prepared diet without considerable time, effort, and expertise. There is no need to feed any tonics/calcium or home diet while he is feeding on a balanced food like Pedigree, except clean fresh water. Other activities such as exercise, training, grooming and regular visits to the veterinarian are equally important to keep your dog happy and healthy. It is recommended to have booster doses for all vaccinations including rabies. Dr KG Umesh: The two most common manifestations of aggressive behaviour towards humans are fear biting and dominance-related aggression. Fear biting is most commonly seen in a dog raised without appropriate human contact during the socialization period of growth. Biting is a canine dominance behaviour and is surprisingly, a form of communication to establish standing within the pack. So, if the pack leader (your dog) decides that a member of the pack (you or a family member) is getting out of line, he may bite that person to show them ‘who’s boss.’ Good training plays a crucial role to ensure a happy and successful relationship between you and your dog (reward good behaviour and ignore unwanted behaviour), that means everyone being diligent in enforcing basic commands to show your dog who the real leaders of the household are. Some examples – If your dog barks, growls, or ignores you, try to shift his attention to an exercise or a task he knows well. If this doesn’t help, walk away from the dog. While instinct is a powerful determinant, dogs also take cues from an owner’s personalityfriendly, secure dogs, for instance, often have calm owners, while dogs who are easily frightened might have anxious owners. Dr KG Umesh: Puppies are not capable of controlling urination or defecation until eight weeks of age. A young puppy needs to urinate and defecate frequently as he has a very small bladder and bowel. Housetraining a new puppy usually takes 2 to 4 weeks and is accomplished through confinement, a regular schedule of feeding and elimination breaks, and a great deal of praise but no punishment. It is your responsibility to ensure that you take your puppy to the chosen toilet area as frequently as he needs to go, generally as soon as he wakes up, after every meal and at hourly intervals. Whilst he is learning, it is essential that you wait with him, so that you can praise him at the correct time. Young puppies will inevitably have ‘accidents’. It is important to ignore these, and to clean up well so that the smell does not linger, as this may encourage him to repeat the performance on the same spot. It is also possible to train your puppy to urinate and defecate on command. Dr KG Umesh: Whatever your reasons you decided to add another dog to the family, just be aware that bringing in a new dog (breed or size does not matter) is a huge change for an older dog – and unless you go about it the right way, it could create a lot of stress. With the puppy in your lap and your older dog on a leash held by someone else, let the older dog sniff, lick and explore the puppy. A couple of minutes is more than enough time for this initial introduction. Remove the puppy from the room, then lavish your older dog with attention and praise. On the second or third meeting, if all seems safe, allow the puppy onto the floor, and monitor that situation carefully for a few minutes. Repeat this exercise at least twice daily until you’re comfortable that the two will get along or have mutual understanding of their position/rank in the family. It’s not a good idea to leave your puppy alone with your older dog. There should always be someone there to supervise. Be sure to give old dog lots of individual attention so he’ll know that he still holds a special place in your heart and hasn’t been ‘replaced’. Neutering may help to minimise some behavioural issues like aggression, etc. Character Certificate to My Buddies will Say : For Xena—A daredevil who loves to play and have an association with all and for Tommy—Listens instructions and keeps constant watch for outsiders entering the house. List of Activities We Like Doing the Most : Playing everywhere, running and visiting places together. What We Indulge Doing on Sundays: Playing, dancing on disco songs and having lunch and dinner together. What is the Best Trick I Have Taught Them : Giving a welcome reception when somebody enters our home. At the pet shop, it was the dark uncontrollable German shepherd pup who caught my attention and heart and I thought of him that night and the next night and the night after. My amused husband lovingly christened him Storm Front Batra on day three. Storm was two months old and he came to us exactly three days after Nero’s death. Used to greeting me with a gigantic jump each time I got back home, all this had to be changed once I got pregnant. On the first day back from the doctor, I took his two paws in my hand and explained to him how “ mummy had a baby in her stomach” and his jumping could hurt it. It was like we had made a connection that afternoon, till date Storm has never greeted me with a jump again. A loving wag, a kitty brush and wet slurps, yes, but never a jump again! In the past four years, Storm has been the center of our universe, the universe shifting slightly after the birth of our first child but once again firmly in place today. Storm – the love of our lives is totally intimidated by our two and a half year old daughter. Scared by her fidgetiness and her whisker pulling, he steers clear of her path, clearly terrified of her hands, he charges to me for total protection. As I write, Storm is trying to nudge a biscuit off Ameera, not managing to get a bite in without dropping his ball which is tightly secured in his mouth, aaah life is back to normal. And I, his Mama, bask in this glory. I am not the usual dog lover. I never had a pet, not even the occasional low maintenance gold fish or parrot. My disdain for dogs is probably hereditary. As a child, my mother was attacked by a pack of stray dogs and the fear of dogs has been transmitted to me through her genes. The twist in the story is that I am now married to a family of dog lovers. For the last seven years before my marriage I had been the single child, my only elder sibling had moved out. From being the focus of attention of the family, I found myself in a situation where I was competing with OSCAR. Oscar is a Golden Retriever, aged 3 years and the blue-eyed boy of the family. Before we got married, Oscar and my husband were roommates, or rather bedmates. Hubby used to wake up with Oscar, silently waiting for him to flutter his eyelids. Sometimes, he would wake up with Oscar lapping his face. All that has changed now. I am sure my husband misses the male bonding that he once shared with Oscar but he never dares to admit it. Oscar now sleeps with my in-laws. Initially, my mother-in-law i.e. Oscar’s mother would bang on our door to wake up hubby for Oscar’s morning walk. However, that was met with strong opposition from me. Getting up at 6.00 am in the morning is absolutely criminal. But, this is not the end of it. Though we have been married for barely six months, husband has a picture of Oscar as a screensaver on his mobile. And you know what his explanation is, “You’re my bibi and Oscar my baby”. Husband cootchie cooes to Oscar and me using the same sweet nothings. I wonder if Oscar has ever noticed this! Even if he has, thank God, he is not complaining. I sometimes wonder if dogs also feel jealous like women. But, things are gradually changing. Oscar and I are now getting to know each other. I allow him into our room but he can only put his front paws on our bed. Maybe, it is only a matter of time that he would find his way back into our bed and into my heart too.